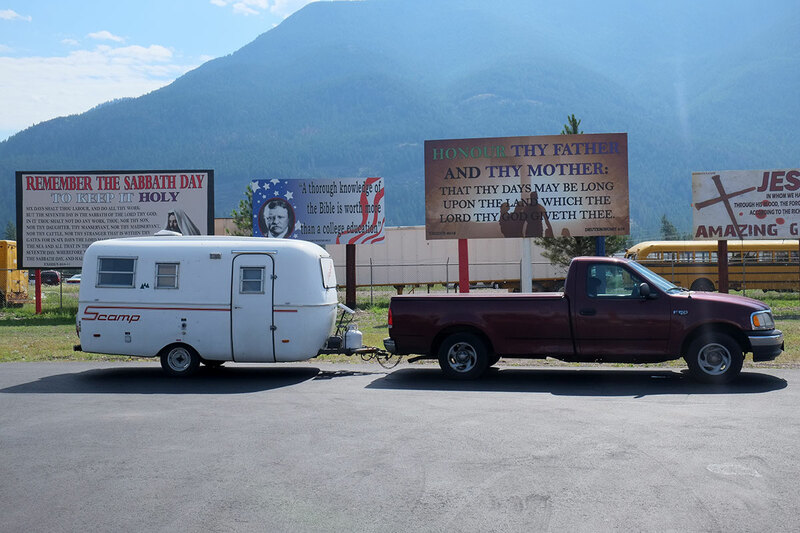 No road trip can be documented without its requisite amount of roadside attractions, kitsch, and oddities. Although it doesn’t rise to the level of South Dakota, the inland Northwest does have its share. The first tipoff was the town of Wauconda. 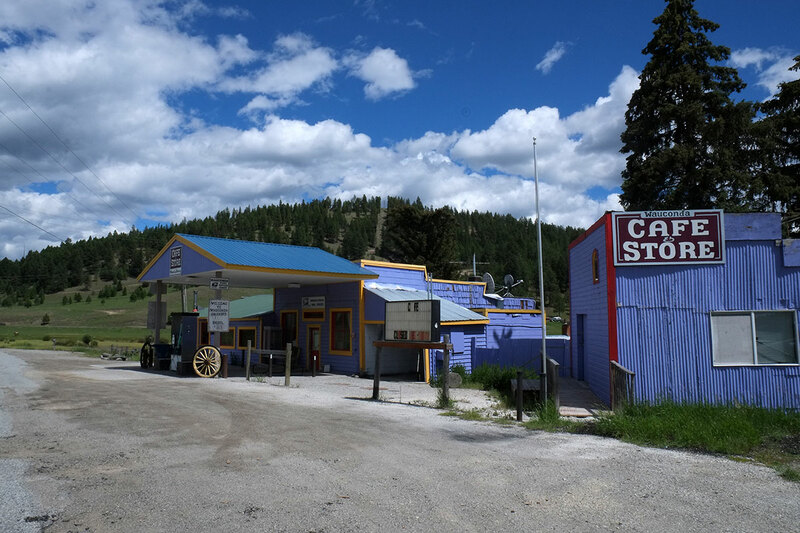 Besides its obvious Black Panther references, the town was mainly interesting for its sole commercial enterprise, the Wauconda Café, which was defunct. 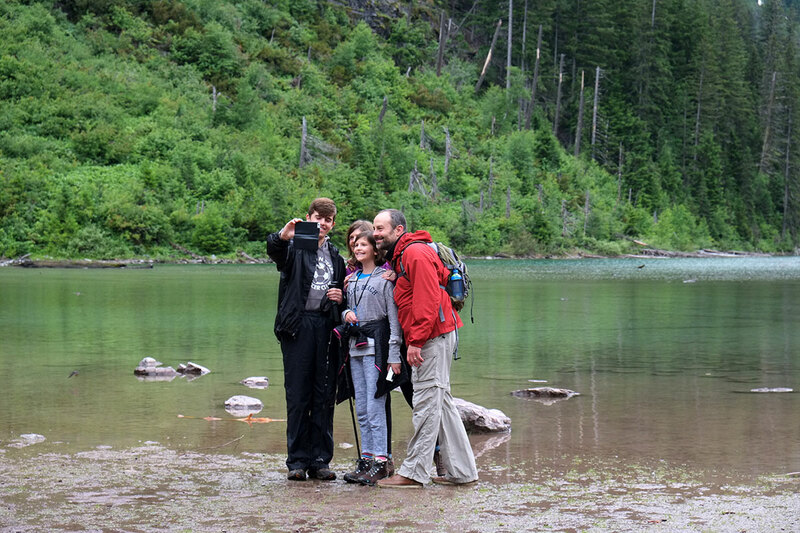 Glacier did provide some opportunities for selfie documentation, but nothing on the order of Bryce, or Niagara Falls. 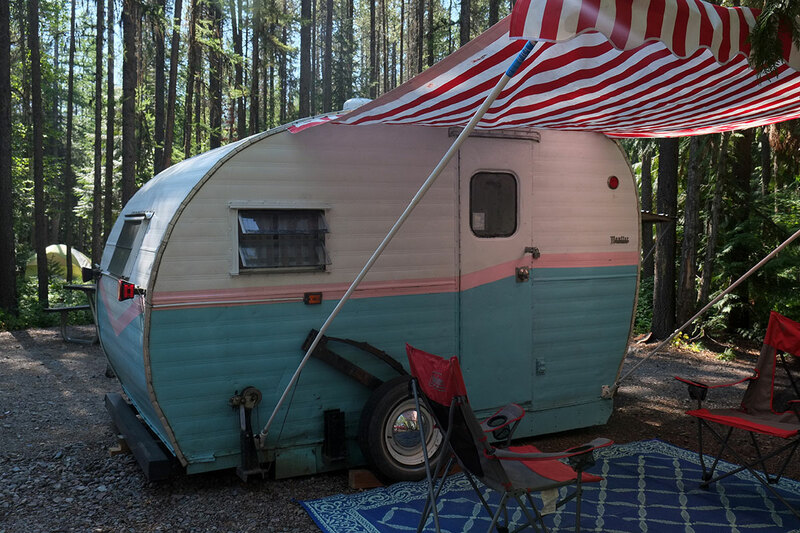 Our campground at Fish Creek mainly had Southerners with huge RVs, but there was some attractive retro glamping. 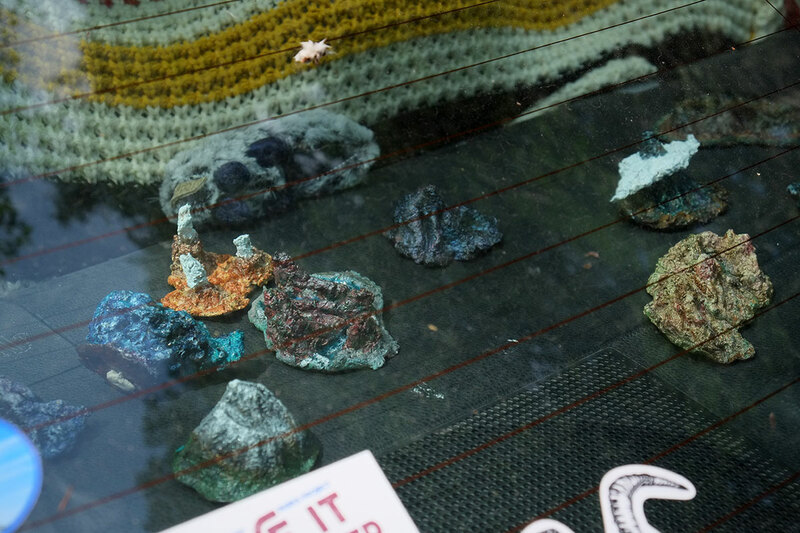 We came across an interestingly accessorized car at Lake McDonald. 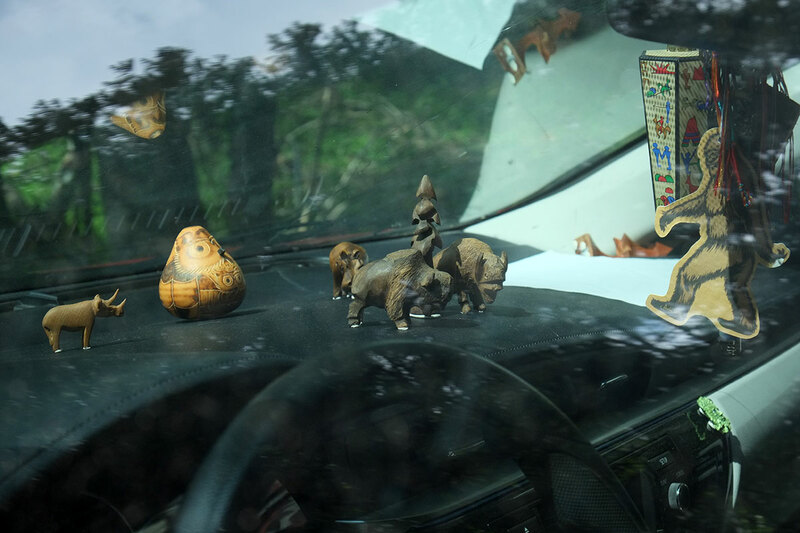 From the bumper stickers we could tell they were National Park aficionados, but their dashboard totems most reminded me of my grandparents’ dashboard, which had an assortment of crucifixes, BVMs, and action figures of the saints. This dash seemed more attuned to the secularized (perhaps pagan) tendencies of our pantheistic age. The rear window revealed these molded constructions., which we guessed were molded clay representations of iconic topographic features that were of special significance to the owners. It was lovely. 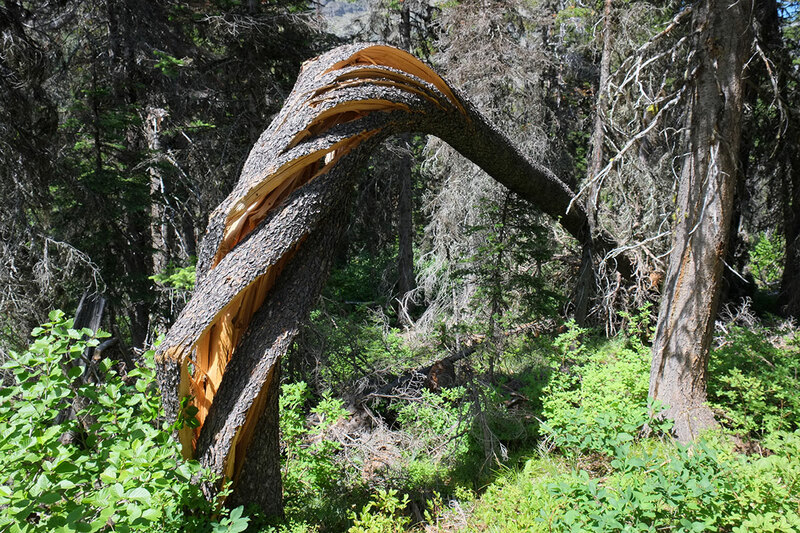 We couldn’t discern the cause of this remarkably twisted tree, but we think it might be used by one of our colleagues in a lecture to illustrate the concept of torque. We thought, Where the hell do you live, buddy, Brooklyn? 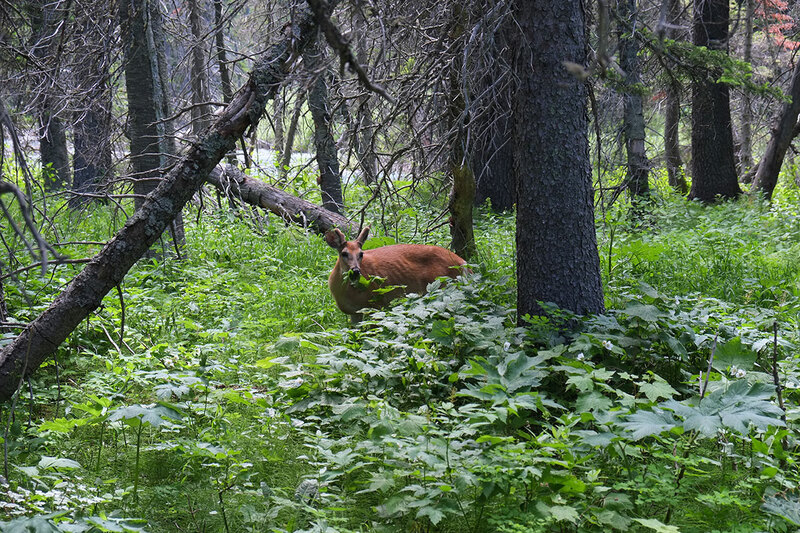 Most of suburban America is under assault from ravaging deer hordes, and you have somehow missed it? I went for a short walk in Coupeville the other morning, and counted 27 deer, right in town. 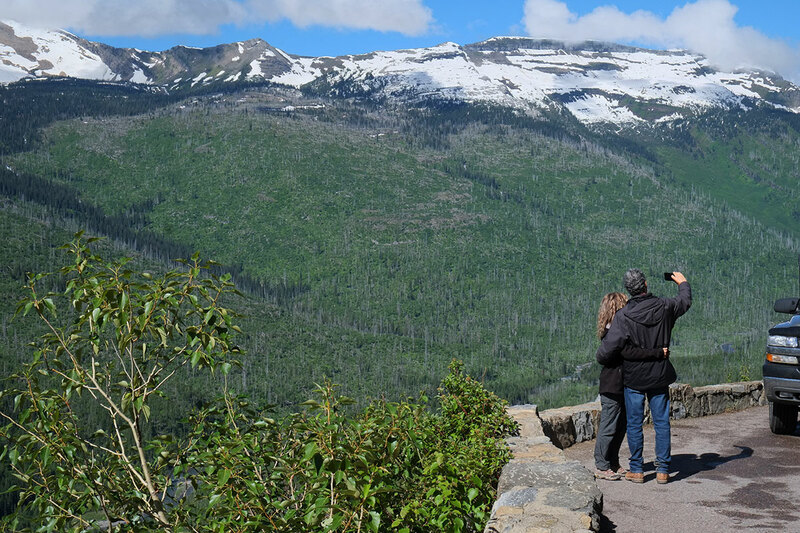 One thing that has changed since our major explorations in National Parks two years ago is the whole political context, and the rise of the Alt-National Park Service. 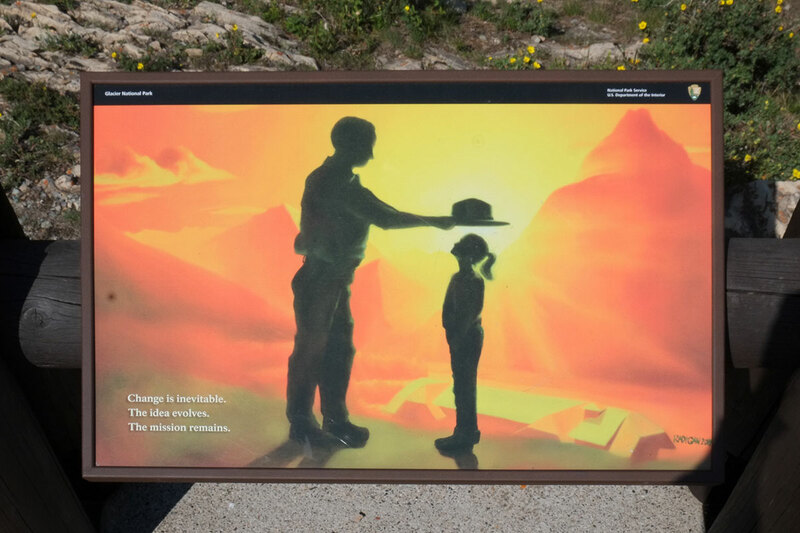 That gave us an interesting lens through which to view this new sign, erected in 2017 outside the Many Glacier Hotel. Bravo. 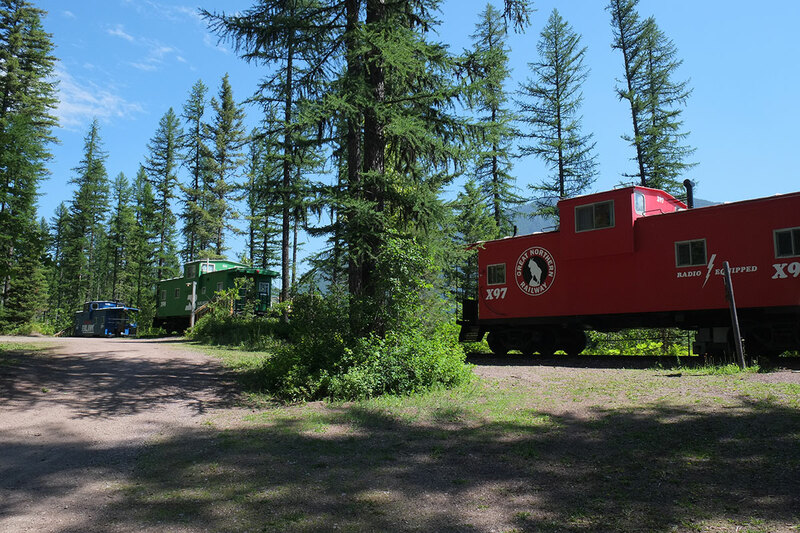 We stopped for lunch at the Izaak Walton Inn in Essex, and saw these excellent annexes to the inn – cabooses that had been converted to guest cabins, mainly used by cross-country skiers. 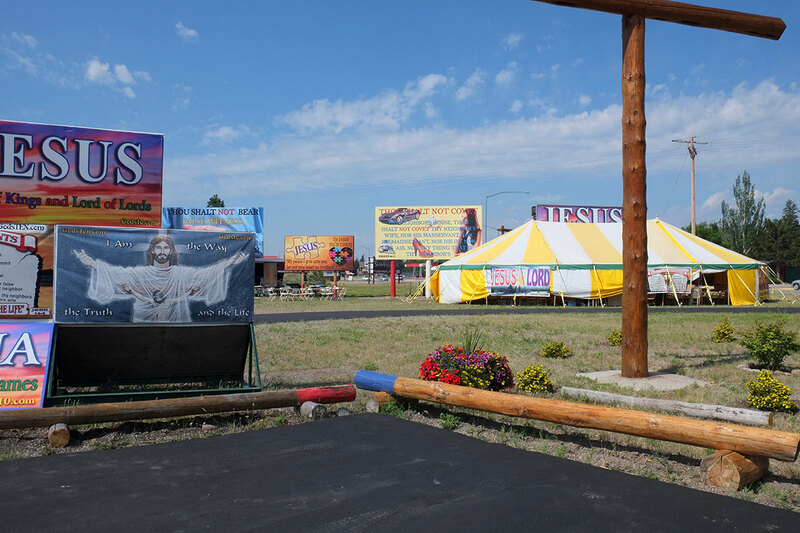 On our way to West Glacier, we had passed this “Ten Commandments Park”, which seemed to follow the Stations of the Cross format, but with the Ten Commandments, and on billboards. Greta was adamant that we had to return to examine it in more detail, as being a secular Eugenean, she doesn’t get to see religious zealotry too often. 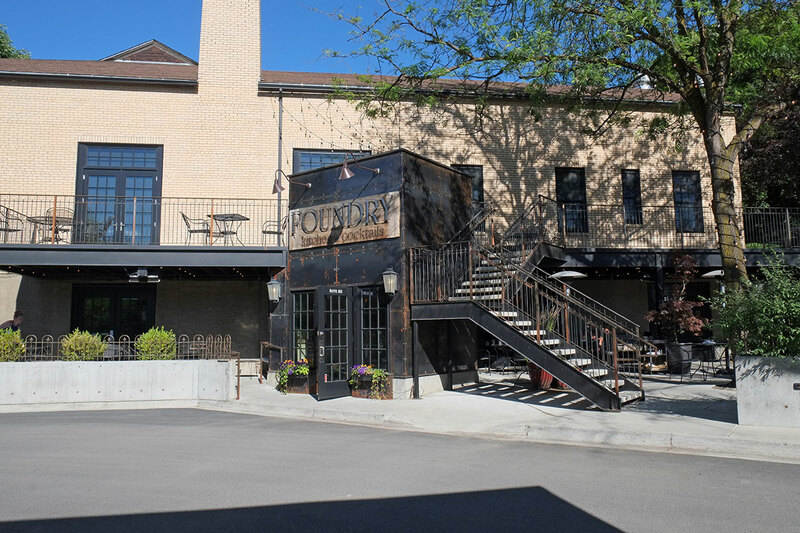 Her willingness to explore the venue stopped short of wanting to engage the proprietors in conversation, especially after she spotted the “Make Jesus Legal Again” bumperstickers. We had been without a cell phone signal for over a week, as T-Mobile doesn’t seem to bother with areas below a certain population density. 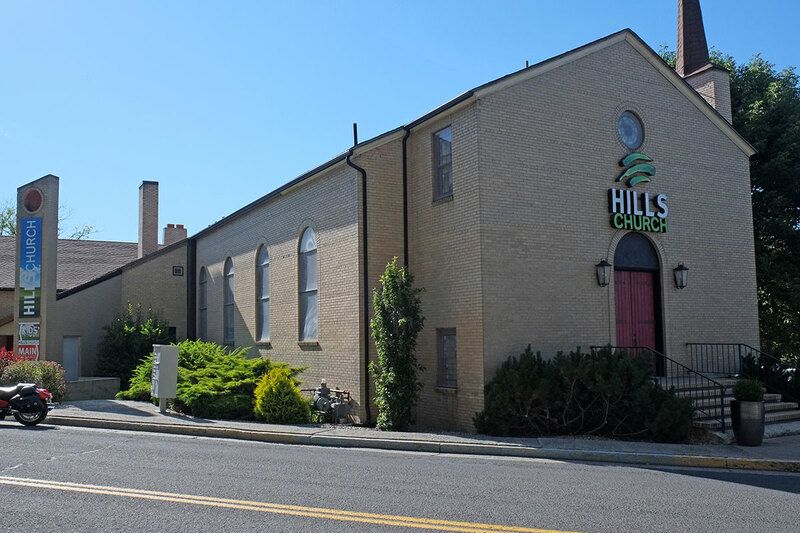 But as we pulled in to the Ten Commandments Park, Linda’s phone erupted with a cacophony of pings and beeps, as the flood of pent-up texts and emails was released all at once. But as we drove away from the Park, all the bars disappeared. It was a miracle, she said. 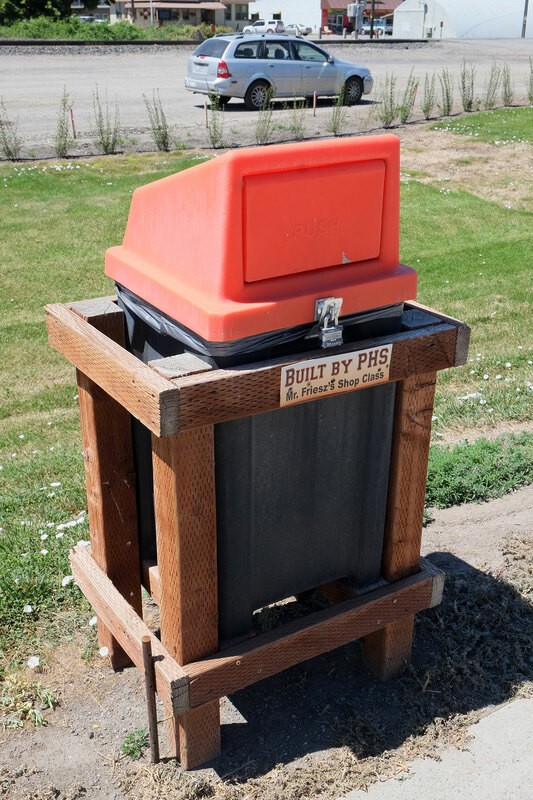 Driving through Plains, Idaho, we came across a whole street with these regularly spaced garbage cans, each enclosed in what we assumed were cages to keep them from blowing away in the winter. We especially liked the plaque on each one, pointing out that it had been built by Mr. Friesz’s Shop Class. which had a quite good bar in its basement! The weekend before Mardi Gras in New Orleans, we had seen an Episcopal church dispensing drinks from its basement church hall, but this is the first time I’ve ever seen a church with an actual bar. Who knew that Pullman would be on the cutting edge of such a cool trend? 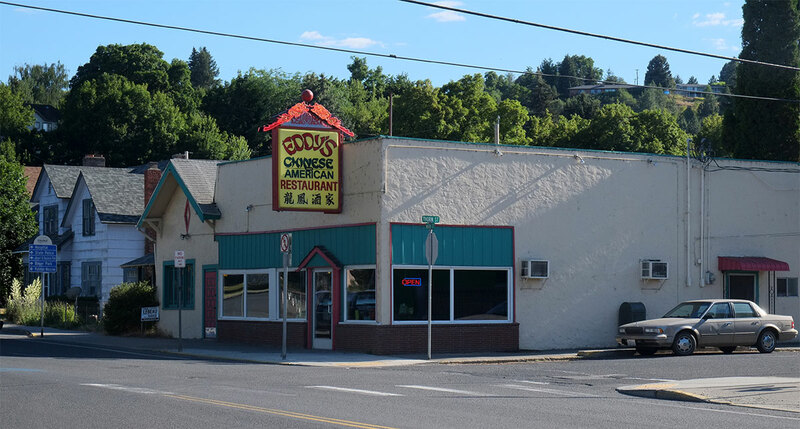 We spent a little time looking for food in the Palouse – very small towns without many options – and in Colfax we came across Eddy’s Chinese American. Despite Tom’s assurance that it was quite good (later independently confirmed by Jug when we returned to Coupeville), its Yelp rating of one star gave us pause. 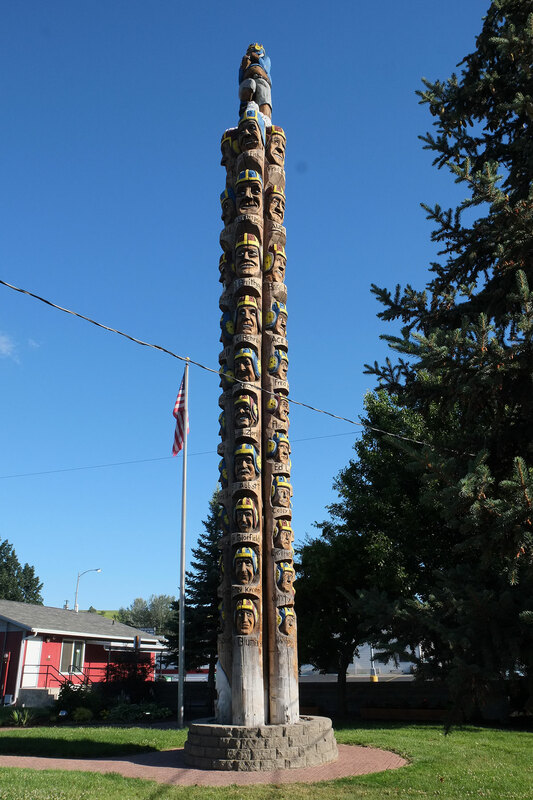 Both Tom and Jug told us that there used to be another Chinese restaurant in Colfax – Pete’s. 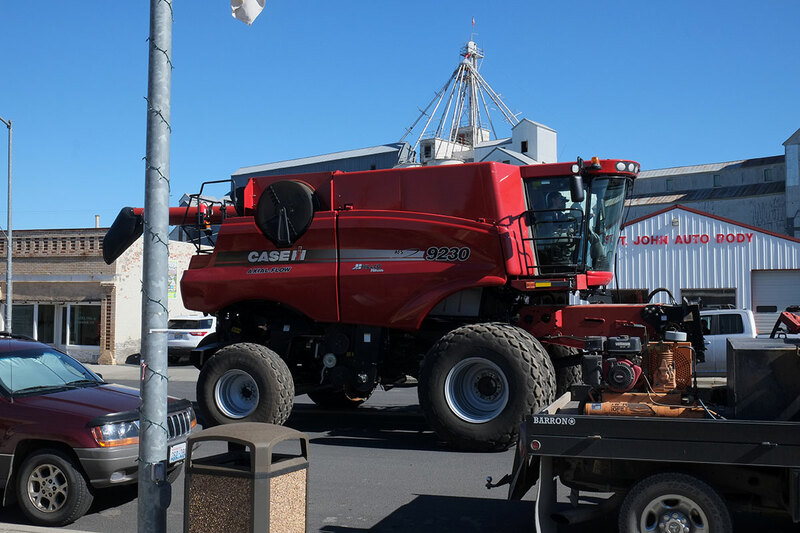 The Palouse may be limited n the culinary area, but it has many options for big machinery. This is the kind of thing we frequently saw driving down the street. 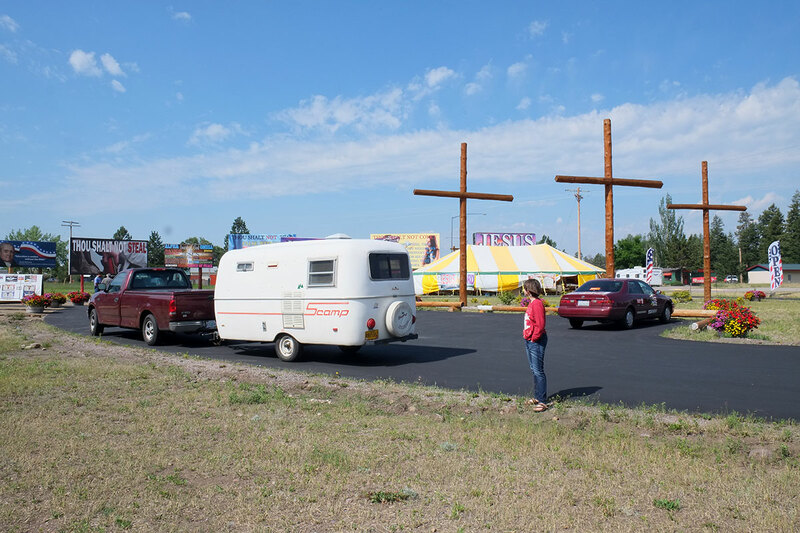 While not technically a roadside attraction, I knew that there were other aspects to the Palouse that would please my family, besides the remarkable scenery. Tom’s barn was full of kitties who, being working farm cats in training, rather than pets, had no idea what to do with a jiggling string. 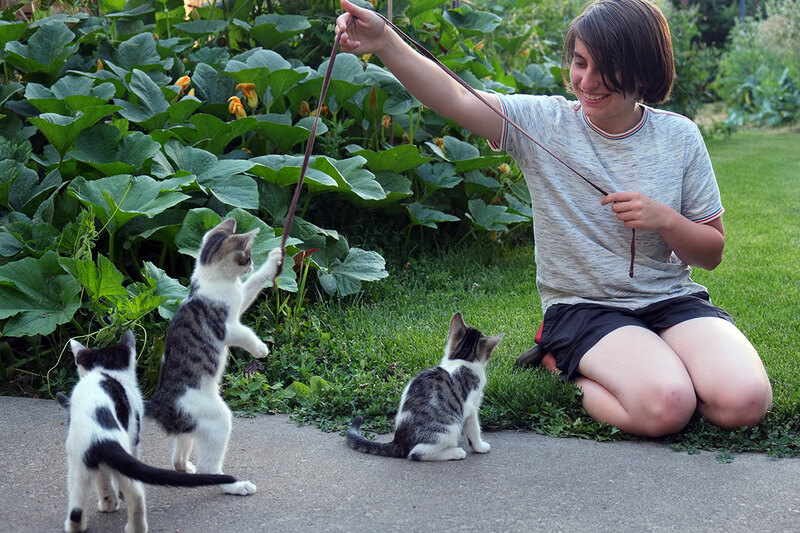 By the second day Greta had initiated them into this new mode of entertainment, and I assume that now they are constantly pestering Tom to pull out that ball of yarn. 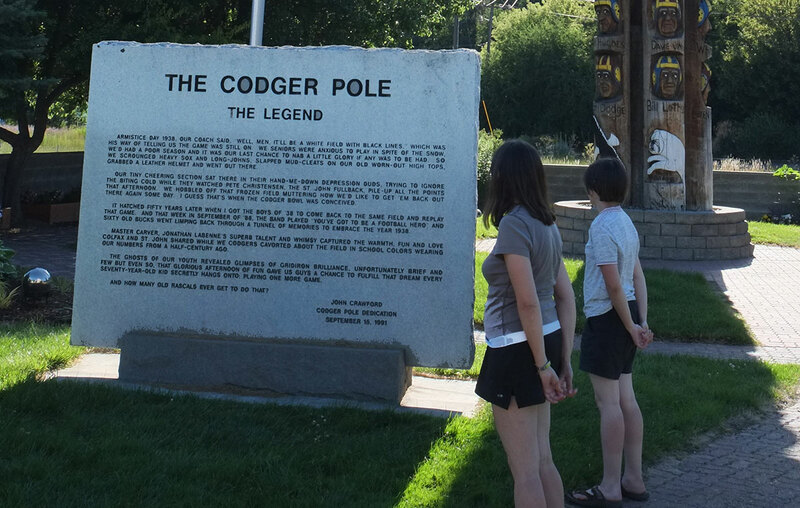 By far the greatest roadside attraction we came across was the Codger Pole, in Colfax. 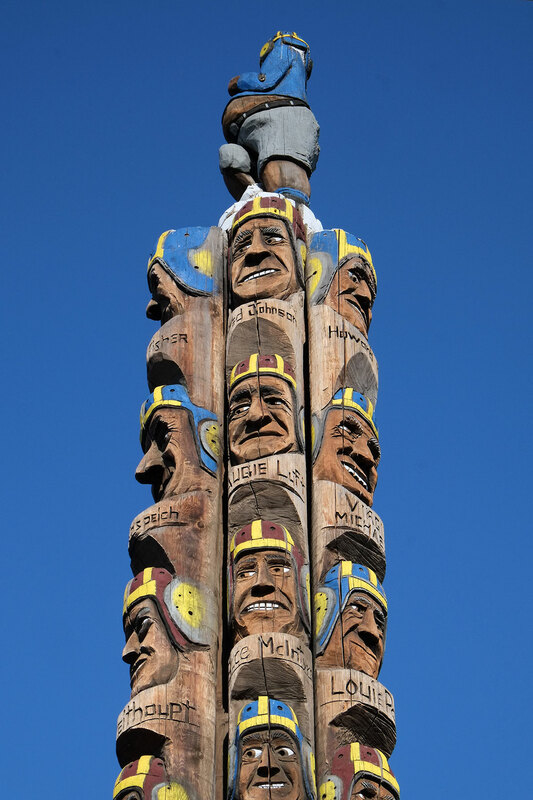 It is the tallest chainsaw sculpture in the world (so they say, and I believe them), and it commemorates two important moments in the town’s history. Their chance finally came in 1988, when the game was replayed by the surviving players, fifty years after the original game. The sign doesn’t mention who won this time, but the occasion was of such note that it had to be immortalized. Sometimes you come across things in small town America that just make you want to live there. This entry was posted in Greta, landscape, life, tourisme and tagged #vanlife on July 28, 2018 by Peter. Fully enjoy your diary. You write amazingly well and your trips are still great. Really like how you are segmenting your posts. 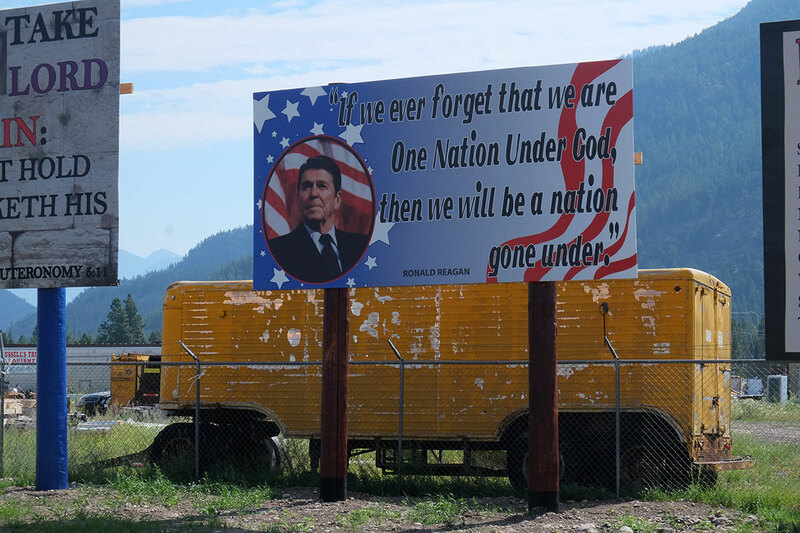 The roadside attractions are great…miracles and all.